CANSPI Board is a CAN development tool for microcontrollers with SPI interface. The Board includes MCP2551 CAN controller and MCP2551 transceiver. 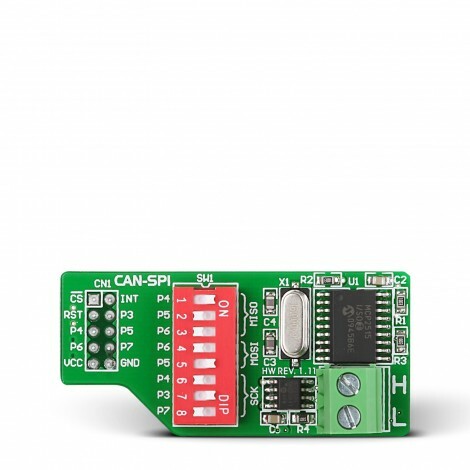 CANSPI Board is a CAN development tool for microcontrollers with SPI interface. The Board includes MCP2515 CAN controller and MCP2551 transceiver. It is capable of transmitting and receiving both standard and extended data and remote frames. The CAN controller also has two acceptance masks and six acceptance filters that are used to filter out unwanted messages, thus reducing the host MCUs overhead.